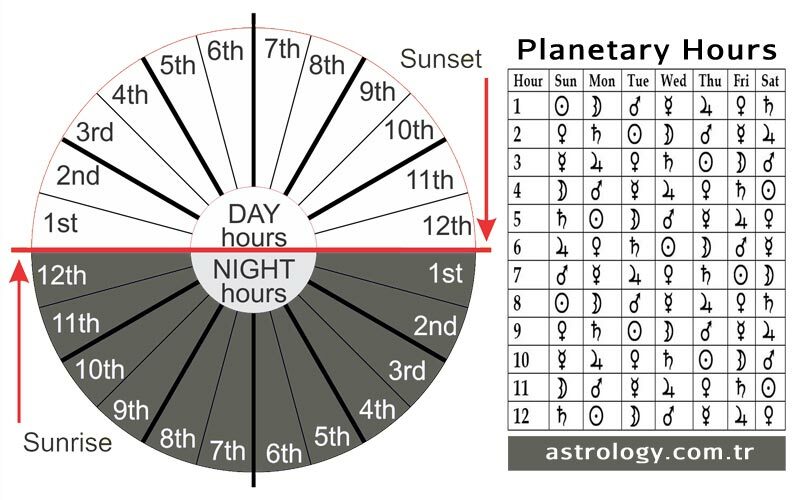 The planetary hours are based on an ancient astrological system, the Chaldean order of the planets. This is the sequence: Saturn, Jupiter, Mars, Sun, Venus, Mercury, Moon, then repeating endlessly Saturn, Jupiter, etc. The Chaldean order indicates the relative orbital velocity of the planets. From a heliocentric perspective this sequence also indicates the relative distance of the planets from the center of their orbits, i.e., the distance of the planets from the Sun (with the Sun switching places with the Earth in the sequence) and the distance of the Moon from the Earth. From a traditional geocentric perspective the Chaldean order also shows the arrangement of the planetary spheres. The planetary hours use the Chaldean order to divide time. Each planetary hour of the planetary day is ruled by a different planet. The planet that rules the first hour of the day is also the ruler of the whole day and gives the day its name. Thus the first hour of Sunday is ruled by the Sun, the first hour of Monday is ruled by the Moon and so on. However, planetary hours are not the same as the sixty-minute hours that we use for normal time-keeping. The day is split into two periods, daytime and nighttime. Sunrise to sunset is considered daytime. Sunset to sunrise of the next day is nighttime. Then these two periods are each divided into twelve equal length hours, which are the planetary hours. The planetary hours of the day and the planetary hours of the night will be of different lengths except on the Equinoxes, when light and darkness are balanced. Each planetary hour is associated with a planet. These can be used to fine-tune a magickal working. This is one step up from performing magick on the day ruled by the planet best suited for the goal. This will give you a specific hour to work the magick. So say you're planning to do a money spell. Money and prosperity is ruled by Jupiter, so you'd want to do it on a Thursday. But to make the spell more precise and give it more "weight", you can calculate the planetary hours for the upcoming Thursday. Four planetary hours are ruled by Jupiter (two of day, two of night), so once the exact times are figured out, you have your pick of those hours in which to perform that money spell. Planetary hours are also good for when you can't wait till the appropriate day. If you needed that money, like, yesterday, and today is Saturday, do the spell today but aid it along by doing it during one of the Jupiter hours. These can also aid you when other things may be working "against" you, or if you're sick but still have to work some magick anyway. Monday Moon Feminine, changes, emotions, secrets, dealing with women. Tuesday Mars Enthusiasm, energy, passion, protection, competition, anything requiring aggression or determination. Wednesday Mercury Law, education, travel, thinking, communications, dealing with siblings, medical. Thursday Jupiter Increase (be careful what you ask for, you will get it in LARGE measure!) good luck, gambling, speculation, merciful, long distance travel. Friday Venus Love, luxury, beauty, decorating, shopping for romantic or creative things, pleasure. Saturday Saturn Long term stuff, career, institutions (such as prisons, hospitals marriage), investments, lords of Karma, good day for a reversal spell. Sunday Sun Wishes, success, happiness, all-purpose, no secretive work on Sunday. • We don't indicate the seconds parts after the minutes part. Planetary hours 08:12 (Start) to 08:58 (End), means 08:12:00 to 08:58:59. • For locations north of 66°34' N or south of 66°34' S latitude, the Sun is above the horizon all day on some days during the summer and below the horizon all day on some days during the winter. • Technically, sunrise and sunset are calculated based on the true geocentric position of the Sun at 90°50' from the zenith position (directly above the observer). • Because times are calculated in local time, there is a chance that future times may be wrong, as changes might be made to dates of Daylight Saving Time or in the local time zone.